My calendar is definitely starting to fill up and I’m sure all of you busy overachievers are experiencing the same. This week, I want to bring you something that I’ve really been leaning into – the liberating, empowering art of planning. I prescribe this practice to so many of my clients and I watch them resist it initially, but when they fully lean into this and incorporate it into their day, I notice such a shift in their energy and productivity. We all have long to-do lists with endless tasks, but this practice is all about slowing down at three key points of the day to help you be more centered. Tune in to discover the art of planning and how this practice can be so restorative and give you even more control of your mind. Stop letting your days just happen to you and take control of every precious minute you have. Download this episode’s worksheet here! How to integrate planning into your day in 15 minutes. Why I prescribe this type of planning to my weight loss clients. 3 times of the day you should plan a break. Why you need to practice the art of planning. How a morning routine has made me more productive. Why I choose three things to focus on every day. Organize a 15-minute Quick Call now and start seeing real, lasting change today! Welcome to Weight Loss for CEOs. 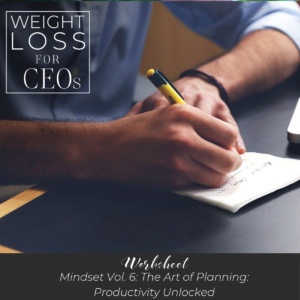 A podcast that teaches executives and leaders how to deal with the unique challenges of achieving sustainable weight loss while balancing the responsibility of a growing company, family, and their own health. Here’s your host, executive coach, Diana Murphy. Oh, hello my friends. I am getting settled into the real new year. Again, I always record a little bit ahead but it’s the first full work week of the new year and I’ll tell you, my calendar’s getting pretty full and I’m really bringing you something today that I think I need to lean in very hard to. I want to bring to you today the liberating, kind of empowering art of planning. How inspiring it has been for me as I watch clients when I kind of prescribe this way of managing their time and day. It is a quick way for you to integrate planning into your day in 15 minutes. Just 15 minutes. If you do a bit more, that’s totally cool, but this is all about starting with short bursts of time and dedicating three different times during the day to regroup and plan. Why so short? We all have very long to-do lists. This isn’t about planning everything. We certainly need a to-do list on the side. This is about pausing and regrouping and slowing down at key points of the day so you can stay more present and focused. The goal is to help you to be more productive and centered. I have found that I prescribe this so often for my weight loss clients. Why? Because when you get more centered and focused, not only do you get more productive in the things that you’re worried about getting done during the day, but you also stay more in your body and more able to really note and follow the hunger scale and follow that intuitive eating that I teach. Alright, so why is this so important? Why am I creating a whole podcast around this? Because for most of us, we let our days happen to us. This is all about creating a practice that is restorative, it puts us in charge, and it guides us into getting into the present moment, as I mentioned, but also guides our mind in the right direction. And why at all do we need to do any planning? Because so many of us are so sincere, and I mean it. You are sincere about making changes in your life, but if you are not deliberate about managing your mind and you’re not looking carefully at all those precious minutes that you’re given in a day, it is really hard to execute that change. Let’s get rolling. I’ll show you what I mean. The plan is to take three five-minute planned breaks during your day. One in the morning, one midday, and one before you retire for the night. If you already use a planner or you use a Google calendar, actually put these in the calendar, especially if this is very new to you. It’s now pretty routine for me, although I am working on the afternoon one, so I am going to start putting that in my Google calendar. Then, the next key is yes, have a planner if you use one, a notepad, doesn’t matter. Does not need to be formal. Next you want a timer. I want you, especially in the morning, to set a timer and set it for at least five minutes. In any of these planning sessions, this is the way that your brain cannot offer you, “But you don’t have time.” You’re just taking five minutes. And it also assures you that you won’t kind of get lost in it and linger too long and be late for your next appointment or getting out the door. Whatever is going on. This helps me to stay focused. I feel like I can do anything for five minutes, that’s kind of a thought that runs in my mind when I talk about meditation or anything, even yoga. It helps me stay focused that it’s only five minutes, I can do this. So the three times of the day are before you retire for the night, morning routine, as you get up, and afternoon regroup. So I’ve kind of named them. I’ll share what I do, but please personalize this with what works for you. Take notes even if you get a chance to listen to this podcast at your desk and really write down what you know would work for you, and I can help you tweak that for sure. Now, this can be done in anything from a simple steno, tablet, a legal pad, a journal that has all your notes and to-dos in it, or a planner. And for the sake of clarity, I’ll share what I do, and that is using a small journal in the morning and a planner. Now, we’re starting at night. Why are we starting at night? This is your first planning is to always start it at night because when we plan the night before, we point our brain in a great direction. And even in our subconscious, overnight when we sleep, our brain kind of gets prepared for the day. It gets pointed in the right direction. You know, coaching and thought work, all of this is really managing our mind. And this is giving your brain an opportunity to be pointed and managed into the right direction into all those activities and things you really want to be getting done. Also, I find I worry a lot less that I’m forgetting something. This causes a lot of worry for me at night and like, am I forgetting what’s on the docket for the day tomorrow, what time do I need to get up, and by doing this before, I do it before I start getting sleepy and I do it a little bit after dinner time. And when I am starting to think about when I need to set my alarm for the morning, I’m like, get out my planner and I do this. I’m encouraging you to make a solid plan before you go to bed so that you can let it go and wait until the morning to start your day and you know exactly what you’re going to do, just open your planner. Alright, so set the time. The time is after dinner, before nine or so, and personally, I tried to do this in the morning but I am learning that the effect, the positive effect by doing this the night before is I now wake up knowing I don’t have to do anything. I can just follow through with what I planned. I can enjoy my coffee. And I don’t know about you, but I’m a little foggy and have a little bit of negative brain in the morning. This is when my self-critical brain kind of wakes up and by already knowing what I’m going to do for the day, it relieves me of that stress. I don’t do my planning in a stressful mind space. That is really key. So at night before I get too sleepy, I get out my Google calendar on my phone or my laptop right next to my planner. I use the Day Designer, but that’s pretty girly for my guys out there, so Michael Hyatt’s focus planner is also a really good one. They’re very similar. They have a top three, they have a way to plan out big projects. And there will be links to everything I mention in the show notes so don’t worry about remembering it. Send me an email always if you need – like Diana, what was the journal? And please just send me an email, diana@dianamurphycoaching.com. I love the tools I use and I love sharing them. Alright, so the show notes address for you is dianamurphycoaching.com/CEO16. Alright, I look at the next day’s appointments and then I fill them in on my planner. So I fill in my coach calls, I fill in things that I definitely have planned to do with the time. And writing those down kind of starts getting my mind in a framework of what else can I get done or what else do I need to do, and I then decide on my top three. What are my top three focuses for tomorrow? Now, after I’ve looked at those appointments, I really see what the reality might be, and I might see what is needed to get done. So this really helps me. It might be content creation, it might be outlining the next podcast, it might be making a set of calls. It might be sending emails or planning a promotion. You know, they are specific projects but it’s never the full project. It may be a part of one unless I’m spending an entire day doing something very narrow and focused. So I literally choose top three that I am committed to and I put those down for my day. Now, I want to give you some other ideas here what happens. I was doing this practice when I was first a coach and I would literally have three top things that really would take at least, I would say, three to four hours. And I wouldn’t look at my coaching calendar. Like, it sounds silly now but I’m such a different planner now. And I would wake up that next morning and freak out that these were the three things I wanted to do and I had six coach appointments. And if you’ve not coached before, six is a pretty full day. I can do more but six is just perfect. I actually get to eat and I have the right energy that is a good flow. But I don’t really have a lot of energy for anything else, so this is what I want to warn you. I want you to be very realistic about what’s already on your calendar and that top three should be realistic. So if I have that full coaching day, my top thing and sometimes my only top three, I write it all across the top three in my planner, coach well. Seriously, that’s all the time I have for in that day and I’m paid to coach, this is my work, my profession, it’s literally I would love to do it actually 40 hours a week. But that is a way that I look at my calendar more realistically. I was creating all this shame that I wasn’t getting all this other stuff done but I was coaching full-time. It’s just silly. So I began blocking appointments and doing thing differently, obviously, but looking at your calendar realistically is really important, especially if you have a very client-focused business or projects and appointments that are all really – somebody else even has access to your Google calendar. You know, really be realistic about what those top three are. Look at what already is planned. Sometimes I even use that top three for intention setting. Like again, those appointments are planned, I agreed to those. Now I decide how to show up and I write those down. If you’re at an all-day event, for example too, it could be the three people you want to have conversations with like if you’re at a convention or at a long meeting. It might be stay focused, there are a lot of ways. It just does sound like intention setting. Most times this is to-do setting for me. I want to end this day with those three things done. I ask this question a lot when I set my top three. What would I be really excited about if I got those top three things done? So it’s a little bit of challenge as well. It gets my energy up for it. Alright, so when you’re on a normal business day, you have some appointments and you have some desk time, what are your three focuses that if you completed them by the end of the day tomorrow, you’d be thrilled? Again, we’re doing this the night before. I make them non-negotiable. All day I check in. I get off a coach call and I’ve sent my follow up email and I’m ready to go with my follow up notes and I’ve made notes in my calendar, what we’re doing next. I take a breath. I might be hungry, I might dash to the kitchen, but I always refer back to my top three all day. I check in all day. It maintains my focus and it helps me to not get off track. This helps me to meet my deadlines and when I’m planning something that I need to execute in the next few weeks, I make sure that that is on a few of those top threes. And that happens by – I actually put those in my Google calendar. But that’s getting broader. I really want to encourage you to take five minutes and write your top three and just look, even if you just have to glance at your Google calendar. I like writing them out, there’s something that that really helps me to write those appointments and the person’s name I’m coaching. It just gets me in a great space. It gets me excited about the day. So this is what works for me. Do what works for you, but take five minutes to plan your next day. Alright, so now we’ve had a good night’s sleep, morning routine. A lot of people are talking about morning routine. I’m just going to share with you mine, but what I want to share with you is this, do one. Just make sure you start doing one. You can personalize this in any way that works for you, but if you don’t have one, start now. So this is the guideline. Get up, walk the dogs, feed the cat, check in on your kids, grab your favorite morning beverage, and set that five-minute timer. This is when you need the timer the most. This is your opportunity to let your mind get clear. Set the timer, just enjoy your coffee, and just let your thoughts float by. Keep a sticky pad near you in case you remember something, but give this time for your brain to just flow, just be present, breathe calmly. Just give yourself some time to walk into your day centered. Just five minutes. Now, a lot of us are different. If your brain is busy, write things down so you get them off your mind and just watch like a ticker tape these thoughts going by. And don’t attach to them. Trust me on this. Just give yourself this time to let your brain calm down and just not get so attached to what’s going on in the busy brain but to just get in your body and kind of calm down and be centered and focused, kind of present. Alright, so that is it. Five minutes. Now, there’s some of you out there, and I am one of them that I have at least a minimum 15 minutes that I routinely start my day. So if you’d like something a little more than just the five-minute timer, if you’re not doing anything at all, please just do the five minutes. But if you are listening to this podcast even again to get more ideas, now you can add a little bit more. I highly recommend a couple of options. The simplest of them is to buy a 365-day quote calendar, and for those of you that are just getting started, I recommend this, especially if you’re finding that you’re really worried in the morning or really busy brain. We call it lizard brain in the coaching world, but it is that self-critical brain of which I have every morning. So if you want a tandem to your five minutes, I recommend having a 365-day quote calendar, scripture, mantras, and this is a really good time of year to buy one and start your day pointing your mind in a great direction. One great quote for each day. Gives you something to think about, you might carry it into your day. One year I had a badass calendar and I’m actually thinking about grabbing it again because it’s fiery. It’s kind of saucy, and I want you to choose something that’s for you. You know, I am a churchgoer so I love having scripture, I have other times during the day when I study or whatever, but seriously, this is like, wouldn’t it be awesome to have a badass quote every morning? Again, that’s a book by the way, very cool. So that was a gift to me and now I’m thinking maybe that’s a gift to me now so that I have that to start my day. It’s all about starting that energy and getting focused. So if you have the time for a little more, I have a small journal that I love to dig into and there’s just a few questions. So at the minimum, again, I’m going to remind you overachievers, five minutes and a quote. You can even sign up for an app that sends you a different quote every day. Do something fun, play around with this. Alright, now when I do 15-minute journaling, and I don’t this every day, there’s some mornings I’m networking at 7:30, I ask a few questions. What does self-care look like today? I write the first thing that comes up and I go slow or get on the mat or eat green. Morning after, if this is a Monday, it might be eat green, getting back on track after having some fun meals on the weekend, or it might be sweat. It might be if I feel like I might be getting sick, it might be just be kind. So other days I notice that things will pop up in my brain like have lunch with a friend. I might not be able to do it that day, or a movie. I’ll find what I’m kind of craving, and this is a way to kind of honor the bigger part of ourselves that are not machines at work but this really good juicy kind of self-care. So first question, what does self-care look like? Top of mind. I put exactly what comes up, and then I try to honor that during that day or put it on my calendar. Next, I write what I’m grateful for. I come up with three very unique things that I’m really grateful for. It could be a kind word I heard from my husband, a new client I’m celebrating, a great weather day. I don’t judge what I put there. It could be a very small thing like I just love the soft blanket that’s on my feet right now because it was cold. I just start that day with gratitude and I’m still practicing this part of my day, the grateful part. I have a dear friend that’s just great at it and she has been deeply developing this practice in her life for years. In fact, she created the journal that I use. Go to maryellengardecoaching.com to find that journal. Again, some of you note, if you don’t find in the links will be in the show notes. I tend to get rote sometimes when I do these journal days and so sometimes, I skip it and just do the five minutes. But also, I get a little rote on I shouldn’t be grateful for the blanket, that’s so trivial, there are people that are suffering, why am I – I should be grateful for everything, right? But this blocks me from being specific and grateful for what’s going on in my life. This is an example. I might have a hard time being grateful for things because I think things should be going differently, like in my business or relationship. This happens to me a lot. That disrupts gratefulness for me. I kind of think that things should be going another way, so I’m kind of grumpy. But if I can turn and be grateful in these moments for what is good or for anything, even in a difficult time, it turns me around. I love starting my day this way. And you know, although it might be difficult to be grateful for something like a difficult relationship, even if I know what I am grateful for in a totally different – even grateful for that person in my life, I’m learning something, right? It softens my attitude. It’s so good. There is a lot written about gratitude. I am no expert, but if you love the model, like I do, see how it plays out. Okay, so the circumstance here, as we go through the model, is morning. Morning is our circumstance, the thought is, “I’m choosing to be grateful.” Well that, I’ll tell you my emotions, and even say it out loud to yourself. I’m choosing to be grateful. See how you feel. I feel good, it’s a warm emotion, it’s positive, and I’m realizing that it almost makes me expectant. Like I’m looking for what’s – I’m going to write tomorrow like, I am so grateful for this, I can’t wait to see what happens today. And guess what? My actions, I’m literally more ready to start my day. I kind of start with a different energy and kind of more energized. Do you hear how my energy just lifted talking about this? This is how we create a great morning routine, and I know that the result for me is I have been more productive by doing this. So decide, take five minutes or 15, come back to this podcast if you start small and want to go back, this really is powerful. When we create that feeling of gratitude, it feels good. And again, we start looking for what’s going right instead of going wrong. Wouldn’t you love to do that? it really helps us with productivity. Our brain can really tend to wake up negatively, isn’t that right? And this morning routine and even the night before, the entire goal is to help you and I to allow the thoughts that are there, just let them float by. Focus on something amazing in that quote, and then focus on self-care, gratitude, and there’s one more. And I don’t do this as regularly and I’m being reminded how cool it is. I decide how I want to feel today. And this really lines up with the top three. Like for example, let me illustrate how this works. I really do decide how I want to feel each day. And it can be excited, it can be proud. Choose emotions that you feel often, you practice, you kind of think more often in your life and you know they work for you. It can be confident. You can literally start every day with an intention to feel confident, and then remind yourself during the day. Now, I’m talking a lot and it sounds like this takes a lot of time, but can you imagine just another question, how do I want to feel? So let me illustrate. If I have a full day of appointments with clients, I might choose centered, calm, curious, or engaged. If I have my mastermind call that day or if I have other things, I might really want to be curious, like be in learning mode. So I put my mind in the right emotional state by choosing how to feel. I know what works for me for different situations, so I’ve been practicing this for a while, and like for another example, if I have a presentation or I’m speaking somewhere, and especially if there’s some nerves involved, I might put courage or clear, proud, or any stronger emotion when I’m feeling nerves. I literally choose grounded confidence hen I know I’m freaking out that I am going to be at a microphone at a luncheon or something. Do you see? We can literally choose an emotional state to start our day. Give it a try. We don’t even need to think too much to choose our intentional emotion for the day. You know, I sense that this hijacks any default emotions that I have waking up. You know, it cures my cranky, it cures the I didn’t get enough sleep. It really is something that kind of sets me right for the day. So we don’t even need to do a lot of thought work like you hear me do on here. We just – this is a way to just kind of hijack default negative thinking and start the day great. Again, I’ll have a quick sheet for you and you’re going to see these quick questions laid out. They’re very simple and you can order the journal from the link that I’ll show you or just keep the sheet and keep it by where you are like in your calendar. So again, it is what is self-care for today, what are my top three gratitudes, and how do I want to feel. That’s it. This is 15 minutes. And on a simpler basis, I’m just reminding you because you’re an overachiever that I want you to just take five minutes minimum every day and bonus is that you look at a quote. Alright, I have a new part of planning that might be a surprise to you. Afternoon regroup. This is new to me and something I’ve been prescribing for clients for a while and realizing that I do in fact need it as well, even though I’m a solopreneur and don’t have a busy, busy afternoon, I kind of plan my own days. But many of us planners, and I’m raising my hand, we rock the morning and the to-do planning. This is just kind of natural for us. And if you’re not, don’t worry. Those two five-minute planning moments can make so much difference, but have you ever thought about stopping in the middle of your afternoon and regrouping? Literally setting a time on your calendar for five minutes. I started prescribing this as homework for so many of my clients because many of us have a really decent rhythm to our day until after lunch, and especially around food and exercise. Like, we’ve got it. I’ve got my morning workout or I’m walking at lunch and I’ve eaten breakfast, I’ve had a great healthy lunch, and oh my gosh, what happens to the afternoons? For most of us they fall apart, especially in busy office life. We start feeling the crunch to finish what is necessary and we start just pushing through. What I’m seeing happen for you is that you stay in grind mode, get it done mode, and your brain is tired. It has been focusing all day. It only has so much energy, right? And you’re starting to focus also on what’s coming after work. I have to pick up the kids, I’ve got this meeting tonight, my wife needs me to do this, my husband needs me to do this, my friends are meeting. Whatever it is, this time of day is so distracting. I don’t know about you but I’m not as productive in the afternoons. And if we can manage this time well, we can maintain our focus and honor our big three that we chose and anything else that comes up during the day. It is so powerful. Let me show you what I mean for afternoon regroup. This is how it rolls. Pick a time when you make dinner decisions, workout decisions, or what time you decide to leave the office decisions, or what time to close up your computer. Even pick a time – and this is what I’m talking about. There’s a time of day that typically spouses get in touch with each other and plan dinner. And this could be in the car while you’re commuting home, but this is that time of day when you’re deciding whether to stay longer at the office, or for me it used to be the time when I decided to work out or not. So pick out an appointment time in the middle of the afternoon so that you have that reminder. Ask what must I absolutely get done today, what can I put on my calendar tomorrow, what can I finish the day with? Look at that top three. You can even cross one out and say, not happening, it’s going tomorrow, and then oh, but I’m going to focus and get this one thing done. In light, you want to ask what must I absolutely get done today. And if you can’t get that all done, and there are things that are straggling that you know you worry about overnight, plan it. Put it in your calendar for when it can be done. And it could be a sticky note, close the laptop. It can be anything that you know that you cannot get done before five or six or whenever you’re leaving. This is so important. This is also in light of your work and family routine, traffic, exercise class, ask the question what time am I going to get in the car and what time am I going to close up my computer. Like so today, I’m recording my podcast kind of after my work hours. I try to work until five and then regroup, but I promised myself I would write and record my podcast in one sitting, and I did it today, very first time I’ve ever done that. Alright, so this is that decision point. Let’s just pick 3pm for our exercise today. So in light of how much work you have to do, the routine at night, exercise, decide in that moment when you’re going to quit. And backtracking a little bit, ask what absolutely needs to be done today. Doing those things in that afternoon zone will refocus your brain and help you finish well, I promise. Now, if there are any things undone, one thing that helps me to not worry is again, putting them on a sticky note for your calendar planning at night. I do that a lot. I just put it right on top of my planner, or leave them out on your desk tomorrow if they can wait. Taking this time in the afternoon absolutely helps your brain to get back on track. There aren’t any missed items to surprise you at 5:30 when you were planning on leaving like oh my gosh, I forgot to do that. And now I’m obviously a solo business owner so my routine might be a little different if you’re in an office environment, and there are definitely things that pop up on you. But if you are clear on what you need to get done, then when those surprises happen, you are in a much better position to handle those surprises. So this happens whether you are in full control of what you do during your day or whether you’re a responsive – you have team and partners and people can come at you during the afternoon. If you take this break in the afternoon and make a decision on what you’re going to focus on and write them out, then you are in a much better position to handle those surprises. You’re going to be surprised at how efficient and how much you can get done. This has been a powerful tool for my clients that want to lose weight. How we handle our afternoons is key and when we push and hustle through the afternoon, it sets you up for a better evening and you’re going to find that you’re going to have less trouble managing cravings and your desire to overeat at night. When we push through the afternoon, we create a lot of emotional energy, and that’s a lot for emotional eaters, and I’m raising my hand, this creates that energy of wanting to eat even though we intended on eating healthy. Let me illustrate. We all do really well during the lunch hour but somehow the afternoon gets confusing. Most of us don’t come up for air like I’ve been saying, and we ignore those hunger signals. And if we don’t have healthy snacks on hand, we’re walking into our homes famished, which doesn’t set us up very well for eating to the hunger scale at night. Another dynamic that I see is you’re working so hard because I know you are and you’re pushing yourself so much that you create this I deserve it energy. Yes, that’s just a thought but I see it as a pattern so much. And when you create I deserve in your mind, it creates a huge desire for a big dinner meal and that creates emotional hunger versus physical hunger and it makes it really hard for you to mind your appetite. So if you would love to manage your evening eating better, and even getting some workouts in, kind of being in control of your afternoon evening time, this afternoon regroup is a power tool. If you can stop, assess, and decide what needs to be done so that you can close your day on time so you make it to the gym or the grocery store, pick up the kids on time, there’s no drama, or you’re home in time to actually have enough time to cook or reheat the leftovers or order takeout, no judgment here. Alright, so I’ve given you a lot and this might be one of those podcasts you have to listen to again and make out your own plan, but that is why in the show notes, dianamurphycoaching.com/CEO16, I’m going to have the sheet for you. I want you to try it, write your own notes on it, maybe create your own, but do it. 15 minutes a day. Alright, have you noticed your brain offering any thoughts like, “But Diana, you don’t understand,” yeah, I know. These are so habitual and they can get in the way so just watch for them. I don’t have time, I’m too busy, I can’t concentrate, I have too much on my mind, I’ve got way too much to do to stop. That’s the point. By stopping at these key times of the day and doing a little bit of not only true calendar planning at night, you’re setting your mind in a clear direction and a clear, calm, and focused mind gets so much more done. A clear, calm, and confident mind gets more done. A confused mind does not. This is going to be much like yoga if you’ve not been doing this. Just get on the mat. My suggestion would be to give it at least 30 days. Then tweak what you’ve learned from engaging in this practice. Again, 15 minutes, that’s it. I’ve added some items to my routine. You notice mine is 15 minutes in the morning, but then sometimes I realize I’m making it way too long and then I skip it. So minimum five minutes in the morning, don’t make it such a chore. There’s some days Fridays and Saturdays are slower starts for me and so I dig in more deeply on those days, but I just give myself permission to skip through that five minutes and just do it fast on the other days. I love what one of my new clients has started to believe. She resisted it first, but when planning her healthy eating and exercise, her new belief is, “Planning makes me more efficient, not less.” Our brain likes to tell us it’s going to take too much time. Don’t let it win. Manage your mind and create a new belief like planning makes you more efficient. You can sense a positive emotional energy when she says it. I love when we talk about this in our calls. Don’t you love it? And you can create that too. Much of this podcast has been written from what I see with my clients and planning homework for them, and it’s now boiled down to just 15 minutes. I love how simple this can be. Give yourself 15 minutes for 30 days and I’d love to hear from you. diana@dianamurphycoaching.com. In the show notes you’re going to have the resources and the links. Drop your email in there so you get the download. Don’t miss out. Thanks so much for listening today. This did go on a little longer than I thought. Like, isn’t it fascinating that I can speak for almost 30 minutes about 15? But that’s the point. We are training our brain to do something new and understanding the why and the benefits to doing it I think will encourage you to do this for yourself. So thanks for listening today. Don’t keep this podcast a secret. My goal in 2019 is to explode my downloads and so be sure to share it with your friends and on social media. Alright, happy planning and I’ll talk to you next week. Thank you for listening to this episode of Weight Loss for CEOs. If you enjoyed this episode and want more, visit dianamurphycoaching.com for Diana’s latest free coaching tools to get started losing weight without having to start a diet now.